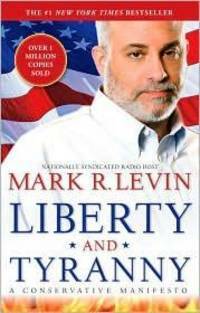 When nationally syndicated radio host Mark R. LevinâÈçs Liberty and Tyranny appeared in the early months of the Obama presidency, Americans responded by making his clarion call for a new era in conservatism a #1 New York Times bestseller for an astounding twelve weeks. As provocative, well-reasoned, robust, and informed as his on-air commentary, with his love of our country and the legacy of our Founding Fathers reflected on every page, LevinâÈçs galvanizing narrative provides a philosophical, historical, and practical framework for revitalizing the conservative vision and ensuring the preservation of American society. In the face of the modern liberal assault on Constitution-based values, an attack that has resulted in a federal government that is a massive, unaccountable conglomerate, the time for reinforcing the intellectual and practical case for conservatism is now. In a series of powerful essays, Levin lays out how conservatives can counter the tyrannical liberal corrosion that has filtered into every timely issue affecting our daily lives, from the economy to health care, global warming to immigration, and more. Threshold Editions. Paperback. VERY GOOD. Light rubbing wear to cover, spine and page edges. Very minimal writing or notations in margins not affecting the text. Possible clean ex-library copy, with their stickers and or stamp(s). Threshold Editions, 2010. Paperback. Very Good. Disclaimer:A copy that has been read, but remains in excellent condition. Pages are intact and are not marred by notes or highlighting, but may contain a neat previous owner name. The spine remains undamaged. At ThriftBooks, our motto is: Read More, Spend Less.Dust jacket quality is not guaranteed. Threshold Editions, 2010. Paperback. Good. Disclaimer:A copy that has been read, but remains in clean condition. All pages are intact, and the cover is intact. The spine may show signs of wear. Pages can include limited notes and highlighting, and the copy can include previous owner inscriptions. An ex-library book and may have standard library stamps and/or stickers. At ThriftBooks, our motto is: Read More, Spend Less.Dust jacket quality is not guaranteed. Threshold Editions, 2010. Paperback. Acceptable. Disclaimer:A readable copy. All pages are intact, and the cover is intact. Pages can include considerable notes-in pen or highlighter-but the notes cannot obscure the text. At ThriftBooks, our motto is: Read More, Spend Less.Dust jacket quality is not guaranteed. Threshold Editions, 2010. Paperback. Good. Disclaimer:A copy that has been read, but remains in clean condition. All pages are intact, and the cover is intact. The spine may show signs of wear. Pages can include limited notes and highlighting, and the copy can include previous owner inscriptions. At ThriftBooks, our motto is: Read More, Spend Less.Dust jacket quality is not guaranteed. Threshold Editions. PAPERBACK. 1416562877 Ships promptly from Texas. . Very Good. 2010. Threshold Editions, 2010. Paperback. Good. Disclaimer:A copy that has been read, but remains in clean condition. All pages are intact, and the cover is intact. The spine may show signs of wear. Pages can include limited notes and highlighting, and the copy can include previous owner inscriptions. The dust jacket is missing. At ThriftBooks, our motto is: Read More, Spend Less. Threshold Editions. PAPERBACK. 1416562877 . Very Good. Threshold Editions. PAPERBACK. 1416562877 Fast Handling - Ships next Business Day!!!! . New. Threshold Editions. PAPERBACK. 1416562877 Crisp pages and tight binding. Light shelf wear on cover. Slight tanning to inside covers only. . Fine. Threshold Editions, June 2010. Trade Paperback. Good - Cash. Unmarked text, secure binding. General use wear to the surface, edges, corners and ends. Stock photos may not look exactly like the book. Threshold Editions. Used - Very Good. Great condition for a used book! Minimal wear. Threshold Editions. Used - Good. Shows some signs of wear, and may have some markings on the inside. Threshold Editions. Used - Good. Good condition. Writing inside. Threshold Editions, June 2010. Trade Paperback Trade Paperback. Used - Very Good. Threshold Editions, 2010-06-01. Paperback. New. Excellent condition. Interior is tight, bright and clean; no underlining, notes or highlighting. Binding is smooth and solid. Paperback cover is clean and sticker free. Minor scuffing and/or corner bumps on the paperback covers due to shelf wear. 100% Satisfaction Guaranteed. All items are carefully enclosed with bubble wrap. We ship promptly and worldwide via US Post and will email you a tracking number. Threshold Editions, 6/1/2010. First Edition. Paperback. Very Good. First edition paperback with full number line. Book in good condition. Threshold Editions, June 2010. Paper Back. Good. Threshold Editions, 2010-06-01. Paperback. Like New. Like new softcover in excellent condition, no writing, non-smoking home, clean text, binding tight, free delivery confirmation on all US orders, West Coast, APO, Hawaii, Alaska, Puerto Rico should opt for "expedited" shipping. Save a tree. Read, Recycle & Reuse. Buy all your used books from Enough Books.